The Economic and Financial Crimes Commission has arrested Ibanga Akpabio, a cousin to former Governor Godswill Akpabio of Akwa Ibom State for his alleged involvement in N10m oil scam. The EFCC said on its official Facebook page that the suspect was arrested on Tuesday in Port Harcourt, Rivers State. 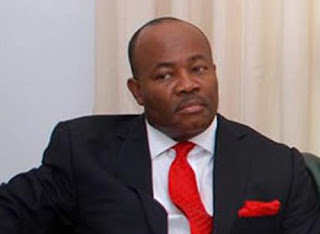 Akpabio’s arrest was said to be in connection with an allegation that he collected N10m from a potential investor in petroleum products. The commission added, “Specifically, Akpabio reportedly approached the investor to invest the money as equity in the purchase of petroleum product directly from a floating station belonging to the Nigerian National Petroleum Corporation. “He allegedly assured the inventor that he had secured all the necessary approvals for the running of the business. It was learnt that the suspect was urgently undergoing interrogation at the Port Harcourt zonal office of the EFCC. Meanwhile, the EFCC Chairman, Mr. Ibrahim Magu, has denied any links to Ibanga Akpabio.. The EFCC said in a statement by its spokesman, Mr. Wilson Uwujaren, that Magu had never met Akpabio’s relative . An audio recording which was posted on an online news medium,SaharaReporters, Akpabio and a certain Osong were heard talking over the former’s relationship with Magu. In the said audio recording, a voice purporting to be Akpabio could be heard dropping the names of some security chiefs including Magu and boasting about the supposed EFCC boss’ willingness to help deal with his purported political adversaries in Akwa Ibom State, especially a certain Robinson Uwak. The statement added, “The commission wishes to state that the claims in this tape especially as it affects Mr. Magu are patently false. The EFCC boss has never met Ibanga Akpabio all his life and could not have been party to any violent scheme to settle unknown political scores in Akwa Ibom State. “Indeed, if Magu were Akpabio’s Man-Friday as he would have his ‘friend’ believe, he would not today be a suspect answering to charges of fraud before the commission.